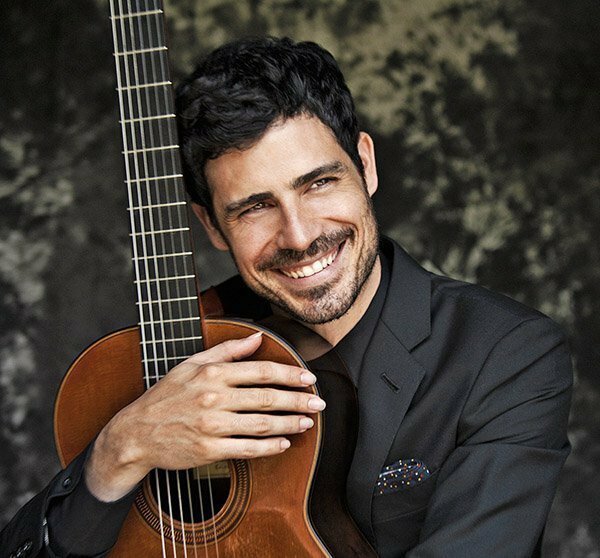 The guitar is “the instrument of the people,” celebrated Spanish guitarist Pablo Sáinz Villegas argued Wednesday at the first of two Celebrity Series solo recitals at the Longy School’s Pickman Hall in Cambridge. In monologues interspersed throughout his program he explained how his countrymen seeded the current worldwide popularity of his instrument (a product of Spain) beginning in the Spanish colonial era. Villegas illustrated his point with selections that revealed underpinnings of guitar music of the Americas. The blending of harmonies and counterpoint from Europe, rhythms from Latin America’s indigenous people, and styles introduced by Americans of European and African heritage, blossomed in the guitar repertoire during the 20th century. Before playing a note, Villegas paced at the front of the stage explaining how the forthcoming show, derived from his 2015 Harmonia Mundi album Americano, would take us on a musical journey through the Americas, exploring the sounds of Brazil, Paraguay, Venezuela, Cuba, and New York City. He opened with the Cinq Préludes of Brazilian composer Heitor Villa-Lobos, who played on the streets of Rio de Janeiro before sojourning in Paris where he met Edgard Varèse, Leopold, Stokowski, and Aaron Copland, among others. The preludes, composed in 1940 for Andrés Segovia, are a staple of the guitar repertoire, performed and recorded extensively. We were curious to see what Villegas would bring to them. The tempo markings for first three are respectively andantino expressivo, andantino, and andante, but Villegas has his own ideas about a walking tempo. Overall, he indulged in exaggerated rubato―in some places to great effect―but where such is not indicated in the score. He took the most liberty with the tempo and pacing of Prelude 3, an homage to J.S. Bach. The work’s A section is marked andante, but Villegas played it slowly, meditatively, frequently breaking momentum to dwell on certain notes, and in other places hastening through a passage. In the B section, he rendered the running 16th notes with a variety of durations. He played so freely that the 36-bar work lasted more than four minutes―even with the omission of its da capo repeat. The virtuosic arpeggio middle section of Prelude 4 came through most impressively, as Villegas articulated the rapid-fire patterns clearly and precisely. He added a percussive slap near the guitar’s bridge after strumming the work’s final chord. He displayed a unique take on Prelude 5 (a waltz subtitled Homenagem à Vida Social) as well. In the work’s B section, he transformed the 8th notes of the bass line that fall on beat one to dotted-8th and -16th notes (with some double-dotting). In the recap of the A section, he found a steady, buoyant waltz groove for an effective finish. Pedro Elias Gutiérrez’s Alma Llanera, identified in the booklet as the “unofficial anthem of Venezuela,” closed the first half. It is based on a joropo rhythm, a Venezuelan adaptation of the bulerias rhythm prevalent in Spanish flamenco. He began at an energetic pace, interjecting rasgueado strumming. Often performed by orchestras augmented with folk harps and charangos and in choral settings, Alma Llanera supported Villegas’s theme of tracing musical lines between Spain and the New World and the embrace of the guitar throughout the Americas. The second half began with the non-American Tango en Skäi by composer-guitarist Roland Dyens. The handout explained the back story of a Frenchman penning a popular tango (the dance originated along the Rio de Plata where Argentina meets Uruguay). The word “skäi” in the title is French slang for imitation leather, and is Dyens’s wry signal that his tango, a favorite of guitarists, is not to be taken seriously. Villegas again exercised much give-and-take with the underlying rhythmic grid, holding some notes longer than notated and rapidly skittering through linear arpeggios elsewhere. While you could not envision a couple dancing to his version, it attractively showcased his formidable technique. The journey reached the Caribbean with the Cuban folk song Guajira Guantanamera (Girl from Guantanamo) by Joseito Fernández. The tune was first popularized in Cuba in 1929 and has been recorded numerous times, including a 1966 hit version by American vocal group the Sandpipers. Villegas smiled as he shared its sunny melody. Paraguayan Agustín Barrios Mangore’s descriptive Un Sueño en la Floresta (A Dream in the Forest) provided another vehicle for Villegas’s deeply expressive playing. He executed the 32nd-note tremolo melody with uncharacteristic loudness while maintaining well-phrased accompaniment beneath. In three songs from Leonard Bernstein’s West Side Story: “I Feel Pretty,” “Maria,” and “America,” Villegas interpreted the melodies in cantabile fashion while negotiating rather guitar-unfriendly chord progressions and modulations. This set drew the most prolonged applause to that point. In another Venezuelan joropo, Antonio Lauro’s Seis por Derecho (Six for Right according to Google Translate), Villegas explained Lauro’s intent for the guitar to imitate a folk harp. The “six” in the title refers to the guitar’s six strings as well the uniquely Venezuelan practice of superimposing the time signature 6/8 over 3/4. Hair flying and arms flailing as he strummed its fortissimo chords, Villegas telegraphed that this was the closer. His encore, a nine-minute pyrotechnical showpiece Gran Jota de Concierto by Spaniard Francisco Tárrega, is to guitar what Tartini’s “Devil’s Trill” or Paganini’s caprices are to the violin. It taps a range of the guitar’s expressive and sonic resources with lyrical sections, blistering scale and arpeggio passages, tremolo, melodies in all registers (including chiming harmonics), and a percussive interlude where the fifth and sixth strings are crossed over each other, fretted, and plucked to produce a faux snare drum sound. He pulled off this final crowd-pleaser with bravado . This review does describe the concert very well. The rubatos were indeed often extreme, to the point that I thought he was perhaps having numerous short memory lapses. For me “Un Sueño en la Floresta” was the high point, although the Tárrega encore was a thrill as well. Sáinz Villegas’ enthusiasm and charm carried the day (evening, rather), and most notable was that he didn’t just perform the pieces, he brought us the music.